After my own writings, I turn to Frank Mosca’s works as the best description of the Option Method. Wendy Dolber invites you to question unhappiness with loving, non-judgmental questions. Unlock self-defeating, spirit- sapping beliefs and find out that happiness is who you are. We're all taught that unhappiness is necessary and inevitable. Perhaps it's time to change our thinking and change the world. Sometimes it can be refreshing and exciting to step off the path we've chosen to see another perspective. We can choose to meander in life if it suits our purposes. We can choose to explore what's down that path we don't usually take. That doesn't mean that we have given up on what is most important to us. Wendy shares a morning of meandering and discovery that may inspire you to take a little trip of your own. In this week's episode, Wendy Dolber, Option Method Master Teacher, talks about the question How do I find my purpose? According to Google Search hundreds of millions are searching for an answer to this question. Why is finding our purpose so important and yet so illusive? Wendy talks about key beliefs that get in the way of connecting with purpose and proposes simple questions that you can ask to reveal what your own personal beliefs are. Could it ever be bad to be happy? Could it ever be bad to be happy? Does this sound like a crazy question to you? How could happiness ever be bad? Isn’t it everything we all strive for? Don’t we all want to be happy? Do you? Not if we believe it could be bad for us. In this week's podcast, "Could it ever be bad to be happy?" Wendy Dolber talks about the three biggest reasons why we fear happiness, what we believe is at stake and how we can move forward to embrace the vision of happiness we aspire to. Tekneshia Day talks with Wendy Dolber about how we can know ourselves, the true meaning of compassion, beliefs that cause unhappiness, what a happy person is like, as well as what The Option Method is and how it is done. Could You Be Against Yourself? Is it really possible to be against yourself? To be your own worst enemy? To trip yourself up every inch of the way? This is the greatest fear of people who fear making mistakes, distrust themselves and others, suffer from anxiety, depression, paranoia and generally feeling there is something wrong with them. Wendy talks about how this fear manifests itself and demonstrates how The Option Method can help unravel and release you from "the terrible wrongness of being." Will you be happy in the future? In this week's podcast, Wendy Dolber talks about our amazing ability to imagine our happiness in the future and manifest it right now. What do you have to have in order to be happy? Imagine what that thing is right now? Be really specific. $1,000,000? A great relationship? Your dream job? Now imagine that you had that thing next year? How do you feel now? Aren’t you happy already just imagining it? Find out how you can use your own desires and imagination to be happy in this moment and every moment of your life. Are You Choosing To Be Unhappy? What if your unhappiness is not a given, but an actual choice? Just considering this possibility can lift you out of the victimization of unhappiness and put you directly in the driver's seat of your own emotional well-being. In this week's podcast of Unlock Your Happiness with Wendy Dolber, Wendy talks about the nature of choice in unhappiness and gives real-life examples that prove it exists. If you've ever felt stuck in unhappiness, Wendy Dolber has a secret to tell you. In this podcast, Wendy discusses the nature of unhappiness, how we create it, how to instantly release it, why it is an illusion, as well as key beliefs that cause unhappiness. Do you want to know a secret? Listen in! Enjoy a spirited conversation with two "tell it like it is" personalities - Tim of The Rec Room Show interviews Wendy Dolber on The Option Method and the writing of The Guru Next Door, A Teacher's Legacy. Topics include: dealing with job loss; how we use unhappiness to ensure success; how unhappiness leads to and complicates health problems, what it means to really know yourself, Christianity and The Option Method and much more! Be An Ambassador of Happiness! Loretta Green Warren (The Inspiration by Loretta Show) interviews Wendy Dolber on how The Option Method can help us to become ambassadors of happiness by creating a pathway to uncover and challenge limiting beliefs. Topics include: What is The Option Method? The First Step in Changing Beliefs, Why We Choose Unhappiness and How to Stop, Finding the Ally in Our Inner Voices and Dealing with Death and Dying. Do you cringe every time you think about flying? Do you break into a sweat? Do you need pills or alcohol to get you through? Do you avoid flying altogether? In this week's episode, Wendy Dolber talks about common fears relating to flying and how you can learn to unravel your fears, relax and enjoy the trip. This can be a challenging question to be sure, but one that can open a pathway to new ways of seeing yourself and others. This question goes right to heart of why people are unhappy. No matter what the circumstance losing a job or a lover or a set of keys. No matter what the emotion anger, hatred, frustration, sadness. No matter what the duration two minutes, an hour, a day, years, a lifetime. No one gets unhappy if they don't value it in some way. Wendy will give you a simple method to find out if you value unhappiness. You Can Be Happy Now! 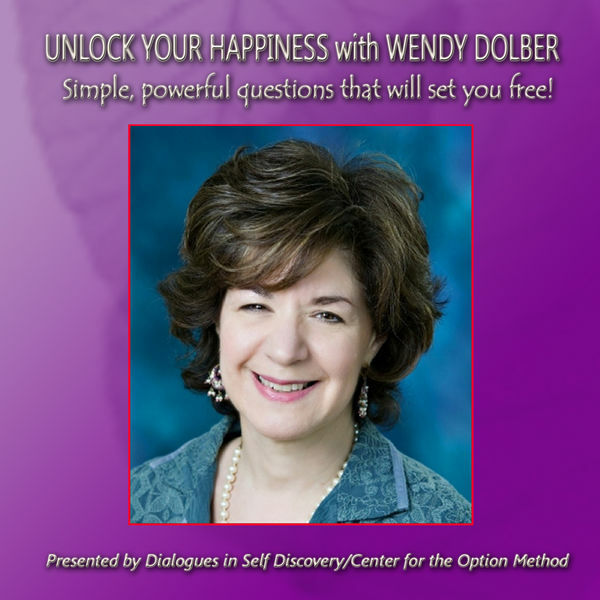 Welcome to the first podcast of Unlock Your Happiness with Wendy Dolber. Got ten minutes to think about your happiness in a completely new way? Join us for some truly out of the box thinking about happiness, unhappiness and living a miraculous life. Unhappiness is the belief that you’re not free.